I can't seem to get the icons to display under Windows 7 and I really miss this from Windows XP. Are you on a network drive? By default on a fresh Tortoise install, network drives don't have the icons added. This solved the problem for us. If this fails for you then obviously you can go through the (slightly) more involved solutions listed here. Windows Explorer has restarted and the TortoiseSVN icons reappear. I, too, lost my overlays after upgrading to 1.6.8 on Windows 7 x64. I only installed the x64 version and not the 32-bit version. To fix, I ran a repair with the original installer and rebooted. The overlays displayed normally thereafter. I resolved it by using Autoruns from Sysinternals. I had the same issue as the OP: Win 7 (x64), TortoiseSVN (x64), and DropBox (x86). The info from some of the other answers gave me all the info. I've only ever had the x64 version of TSVN installed on this machine. In my case TSVN and DropBox were installed the same day I did the OS install and the overlays worked fine until a couple of days ago. I did nothing involving changing settings for either app to cause them to stop working. I verified that only the overlays corresponding to the first 11 entries display in Explorer. When I modified the order of above entries by adding 'z' to the start of some of them, again only the first 11 overlays (under the updated order) would display. With the above I had everything I needed to solve the problem (either rename or or delete entries so that the TSVN entries I want working are <= #11 on the list). Below deals with wondering why this suddenly happened. I know that based on the overlays that worked prior to a couple of days ago, keys 1-3, 7-9, 12-13 were all <= 11 in the list (not sure if overlay #14 ever worked since I never had files w/ read-only status. #15 never worked on this machine so i know it was never in the top 11). I also assume the block of TSVN keys move up/down in unison, therefore they were bumped down either two or three places (* see below). This implies that 2-3 items were added between the DropBox & TSVN blocks. The three that are there now are added by Windows and I would assume they'd be there as soon as the OS installed. Is the list of 15 overlays determined at run-time? Seems like the overlay handlers might sometimes tell the windows shell that there are no icons to add to the list. Possibly some settings I messed with a couple of days ago related to file sharing and file encryption caused some of those items at the 4-6 spots to become "activated" and push the SVN ones down. They display fine here. Are you using the 64-bit version of Windows 7 along with the 32-bit version of TortoiseSVN? If so, then they will only show up in the 32-bit Explorer (or in the CFDs of 32-bit applications). You can install both 32-bit and 64-bit versions side-by-side, though. Kill TSVNCache.exe and let it re-launch. This has caused my shell overlay icons to re-appear on several occasions. If you've recently upgraded TortoiseSVN from a previous version, you may need to upgrade your working copy. 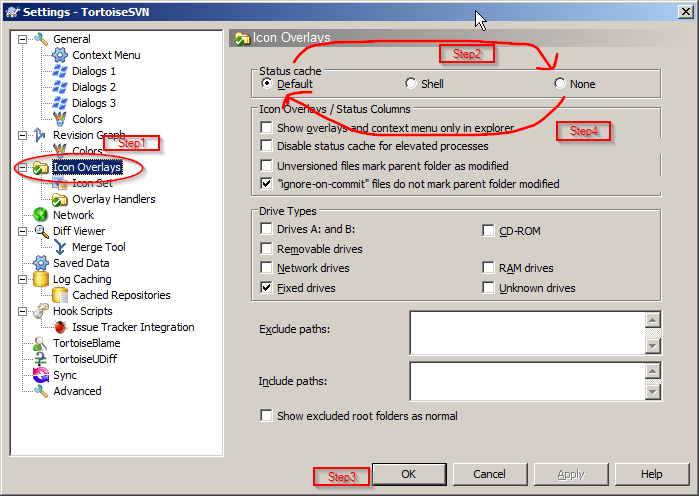 This can be done by right-clicking on your project folder and choose "SVN Upgrade working copy" from the context menu. My icons had disappeared too. The registry fixes did not work for me either. 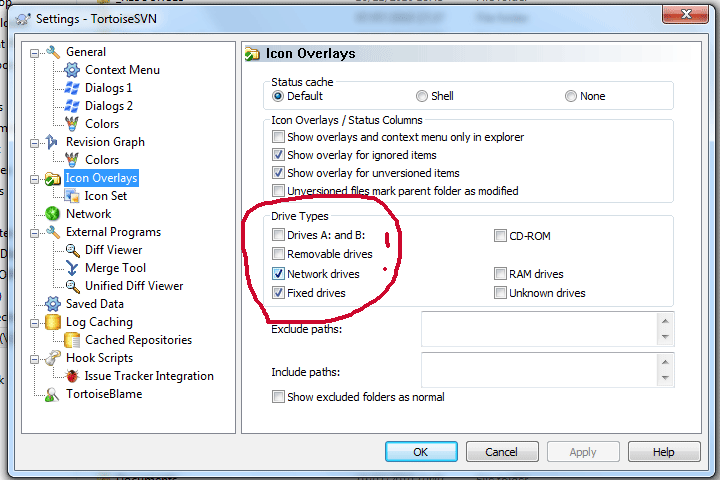 Sometimes you just need to go to TortoiseSVN "settings", turn the icons off, click "apply", turn them back on. Same problem for me. It turns out that the cause of the problem was the new JungleDisk 3.0, which rudely installs three overlays named "1Sync..." "2Sync..." and "3Sync..." pushing the Tortoise ones off the end. Just delete those JungleDisk keys in the reg hive listed at the top (or prefix them with z_) and re-start the system and Tortoise should work fine again. Given that this overlay limit exists in Windows and is easily hit with current tools, tool vendors really should ask during advanced installation if the user wants to install them. I have no need nor desire for the new "Sync" feature and don't really care for the tactic of stuffing the icons at the top of the list with clever naming. Shame on JungleDisk. Have you tried to change in Tortoise Settings the status cache to 'Default'? I had this problem with the overlay icon on folders because I had this option in 'Shell'. The option is in Settings -> Icons overlay. In my case, Dropbox overlays were starting with a " (quoted identifier) in the registry. I deleted all the " prefixes and restarted explorer.exe. Edit: I installed Windows 10 and this solution didn't work for me. So I just went to the same registry location and deleted all Google and SkyDrive records and restarted explorer.exe. Second edit: After installing TortoiseGit it fixed everything without any customisation. I just upgraded to TSVN 1.6.8.19260 on a WinXP and two Win7 machines. After upgrading, the overlay icons disappeared on all 3 machines. Under the above mentioned registry key, I only found the entry for offline files. I simply had to reinstall/repair the TSVN installation and the icons reappeared after a reboot. I've never detected that behaviour in any previous TSVN version and I certainly installed TSVN everytime the same way with the same permissions. If you have recently upgraded Tortoise SVN, it may be because version 1.7 seems to need a new format for storing the status of files - in which case, you can right click the root folder of your repository in question, and use the Tortoise menu option of 'SVN Upgrade Working Copy'. This resolved the problem for me. If it's overlay icons are showing up you'd have to actually be using the 32-bit Windows Explorer, which of course means you'll have to also install a 32-bit version of TSVN. 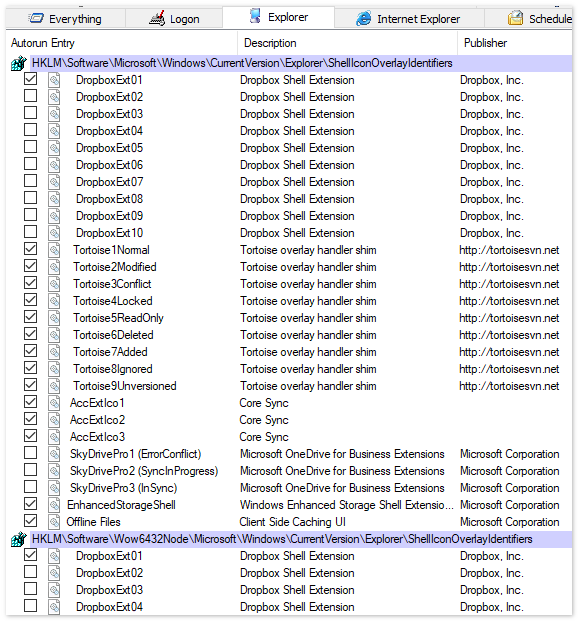 Unfortunately, it looks like the registry entries for 32-bit got hosed, so the 32-bit extension DLL, even though present, does not have the correct registry entries. If in doubt I suggest to deinstall TCVS and TSVN. Maybe after installation reboot twice, not only once. And if they still don't show up go to software control panel and choose to repair the installation. That did the trick for me with when upgrading from the previous to the current version. You should probably install the TortoiseXYZ variant you plan to use mainly first, to improve its chances to fall into one of those limited number of overlay icons slots before the TortoiseXYZ variant you use less. Always keep these limited number of overlay icon slots in mind when trying to analyze malfunctions. I found that if you install the 32bit version first it some how mucks up the 64bit version. On reinstalling windows 7 i just installed the 64bit version and it seems to work fine now. Kris Erickson is right, vote him up. In my case the problem was installing TFS powertools , which adds explorer shell integration just like TSVN and TCVS. It adds another 5 overlays. Since they are prefixed with Tfs*, they take priority over Tortoise*. I also just prefixed the Tfs stuff with z_ and the TSVN overlays came back. No need to reboot/logoff though, just kill explorer.exe and start it again. Limitation of number of usable overlay icons by Windows, refer to Kris Erickson's answer. Inappropriate setting of TortoiseSVN, refer to Ralph Cowling's answer. Known bug for updating from earlier version (pre 1.6.10), see here. TortoiseSVN was not installed for all users, try to install with cmd like below, if all below three solutions don't work, I believe this method will save your life. rem Set your own path. rem These codes mean that the product is properly installed, even though the code is not zero. If anyone needs the registry entries for Windows 7 64-bit, here they are. What was good for me as to remove the overlays for items not really used often: Drop Box, Google Drive, Microsoft Products, and just kept the overlays for Tortoise. These are all the overlays - nothing is removed. ** Caution ** Playing with the registry can make your system unstable. Be sure to backup your registry. See this Google search on various ways to backup your registry or registry setting(s). After upgrading to TSVN 1.6.8.19260 I had the same issue (no icons in Explorer), but in my case, there were NO entries at all for TSVN under HKEY_LOCAL_MACHINE\SOFTWARE\Microsoft\Windows\CurrentVersion\Explorer\ShellIconOverlayIdentifiers. In my original install, I didn't included the additional icon sets, because I never use them (and I've never installed them in any previous upgrades). I modified my installation, adding the additional icon sets, and my icons have magically reappeared. I had same problem here with TortoiseSVN 1.6.16. Icons were fine, but then I installed and uninstalled TortoiseGit and suddenly the TortoiseSVN icons stopped working. Looking at the registry I discovered that uninstalling TortoiseGit also removed all overlay icons. I simply reinstalled TortoiseSVN and it fixed the issue. A combination of solutions worked for me. I tried to kill and restart explorer.exe as suggested by @LeighRiffel. Did not work. I uninstalled dropbox because I rarely use it. Then, I tried the explorer thing again and it worked. Maybe you can reinstall dropbox after this and see if things are okay ? I don't care though. Here are the steps: Run taskmgr.exe or task manager > processes tab > select explorer.exe > kill. Then click file option > new task > enter explorer.exe > ok. I tried everything here (and some otherplaces), and what worked for me (after doing all of these, the registry changes are mandatory I think) was to change the setting for Icon Overlays\Status Cache from Default to Shell, and I also checked "Show overlays and context menu only in explorer". Not sure which of those two did it but it works now. When I checked out a new project from the repository, I did not see the icon overlays. I started looking for solutions and came to this question. While reading answers, I noticed the icon overlays appeared on my checkout project. I guess it just took a few minutes for the icons to appear. I thought this might be useful before people panic quickly and start editing the registry. Changing the registry worked for me. If its helpful to anyone, I initially prefixed "z_" to the entries in "ShellIconOverlayIdentifiers" that I wanted to move down. However that didn't seem to bring up the TortoiseSVN entries. It might be due to case sensitivity wherein lowercase "z" still precedes uppercase "T". Finally, prefixing with "Z_" instead did the trick. Not the answer you're looking for? Browse other questions tagged windows svn tortoisesvn icons or ask your own question. How to view all revisions in TortoiseSVN? iPhone App Icons - Exact Radius? How to add a browser tab icon (favicon) for a website? How do I run Redis on Windows?